U.S. Lifts Economic Sanctions Against Myanmar : The Two-Way President Obama issued the executive order on Friday, saying he made the decision in light of political reforms in the Southeast Asian nation. President Barack Obama and Myanmar's leader Aung San Suu Kyi meet in the Oval Office of the White House last month. The U.S. has lifted sanctions against Myanmar that have been in place for nearly two decades. President Obama issued the executive order on Friday, saying he made the decision in light of political reforms in the Southeast Asian nation also known as Burma. This move was widely expected. 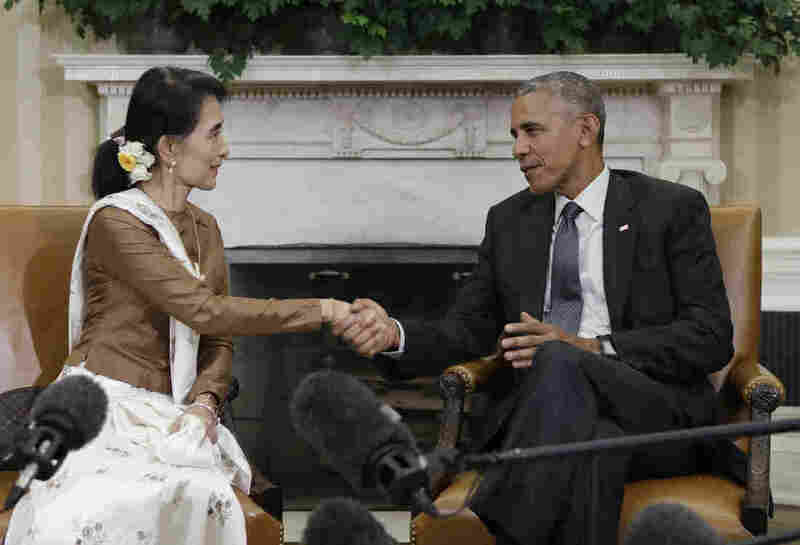 During last month's trip to Washington by Myanmar's de facto leader, Aung San Suu Kyi, Obama told reporters that he was going to lift sanctions "soon." As we reported at the time, he said it was "the right thing to do in order to ensure that the people of Burma see the rewards from a new way of doing business, and a new government." The sanctions were imposed in 1997 and were meant to isolate the military junta then ruling the country. Although the military remains powerful, the country has seen major changes recently. In March, the country elected a civilian leader for the first time in decades. "With these advances, U.S. national security and foreign policy interest no longer support the blocking of assets and other measures," Obama said Friday in a letter to the speaker of Congress and the president of the Senate. "While Burma faces significant challenges, including the consolidation of its democracy, the United States can, and intends to, use other means to support the government and the people of Burma in their efforts to address these challenges." "In 2012, the Obama administration began to ease some financial and investment sanctions following political reforms, according to the Treasury Department. But it 'retained more targeted restrictions on military-owned companies and dozens of officials of the former ruling junta,' as The Associated Press reports. "These changes are designed to create incentives for U.S. businesses and nonprofits to invest in the country, Obama said."